Jack Russell Terriers are known for barking. Misha is no exception. Some dog breeds are just more vocal than others. I’ve worked through many of her behavioral issues in the past 4 years. While I’ve gotten her outdoor barking under control, I can’t get her to stop barking at the front door when there is a noise. 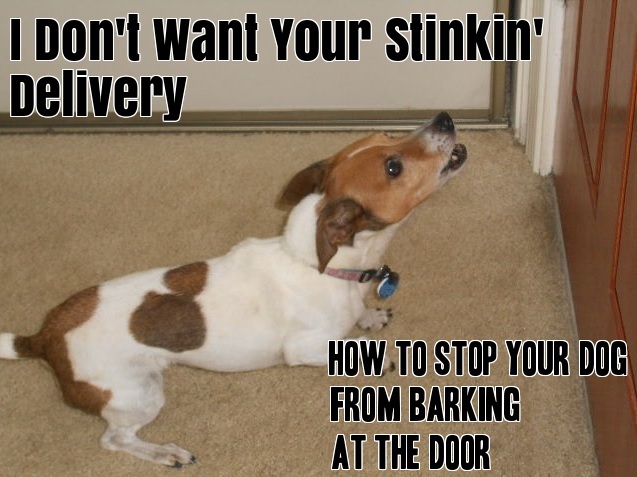 Can I get my dog to stop barking? A while back, I made an effort. Since most of Misha’s barking episodes involved things happening outside the front door, we placed a shaker can (a soda can with some pennies inside) by the front door. When she barked, we shook it. It had some affect on her, but not a great deal. Then, as humans do, the shaker can got moved during the holidays. We forgot about it. Slowly, my dog reverted to her old barking ways. So, here I am a year or so year later trying to determine if I can get this Jack Russell to stop barking. Is she to old to be trained? It’s important to note that you don’t have to do it alone. Their are dog trainers who work on specific behavioral issues. There are also some great books that can help with behavior modification in dogs. These books can guide us through the problems we are having and give us ideas and tools for dealing with them. One that’s on my bookshelf that I refer to regularly is Brian Kilcommon and Sarah Wilson’s Good Owners, Great Dogs. This book takes a common sense approach to raising dogs and dealing with behavioral issues. It’d be great not to create these problems in the first place, but we can modify our dog’s behaviors if and when problems arise. Shaker Can–A can filled will a couple pennies can be effective. (Instructions for making your own shaker can are found here) You startle the dog by shaking the can loudly a couple of times. Some folks toss it at the dog (not so you hit your dog!) so it seems to come out of nowhere. They connect the can with barking. They don’t want to hear that shaker can, so they modify their behavior. While we had some success with the shaker can, it became one more thing she was afraid of. It just made her run to the other door to bark. This is a great tool, but not the right fit for Misha. Command Training–Your voice can be an effective tool through teaching your dog voice commands. Use words and phrases like “quiet” or “no bark” when you want your dog to stop barking. Treats can be used to help reinforce the command. My biggest obstacle in this approach is getting Misha’s attention. When she goes into dog barking mode when the UPS truck arrives, for instance, it is as if she is in a zone. She hears nor sees anything but the front door. She is focused on the threat and it’s difficult to break her from it. Barking Cessation Tools–There are a variety of collars and devices designed to break the dog barking cycle. They work by giving off a high pitched tone or spraying water in the dog’s face when they bark. Other similar devices can be plugged into the wall and offer a high pitched noise when a dog barks. This might work with my dog, though I’d prefer to try other methods first. There are cheaper “devices” such as squirt guns. You spray the dog when they bark. The problem is you must always be ready for a barking tantrum so you can spray them at the right time. It’s a commitment. Unless you are going to be consistent and use the squirt gun every time the dog barks, this isn’t going to be effective. Rather than giving up and waiting for the neighbors to file complaints, I will take action. This is how I plan to work with Misha. I’m going to try the verbal command method coupled with behavioral modification using treats. It cost nothing except time. I have plenty of that. I will combine it with a visual command to reinforce the words. I have already trained her by voice command to leave the front door for less stressful encounters such as the mail carrier’s daily visits. The command is “Wait Spot” or “Go to Your Wait Spot”. I point my finger to the area away from the door and she will run to it. She self “wait spots” on occasion. If she sees me going to the door for the mail, she will go to her spot by the living room chair. I know this method can work with her. Ultimately, behind all that energy, Jack Russell’s love to please. Choose a command: The important thing is to use the same command so that the dog knows what you’re talking about. It doesn’t matter if you use “no bark”, “quiet”, or something in German, just as long as you use the same command all the time. I spent a little time observing myself to see which words come more naturally (besides swear words). The word I use the most is “hush”. That’s what I’ll stick with. Use a treat to reinforce the command: My dog is food motivated. I know that if their is a treat involved she will come. I don’t necessarily want her to gain 20 lbs while learning the command, so I’m going to use regular ol’ Cheerios. She loves them and I can break them in pieces to make her think she is getting more. Find a distraction: This is the hardest part. I can lure Misha with treats if I can get her attention. Sometimes she barks so frantically that she doesn’t even acknowledge my presence. Behold the “Hush Bag”. This plastic bag is the lure. 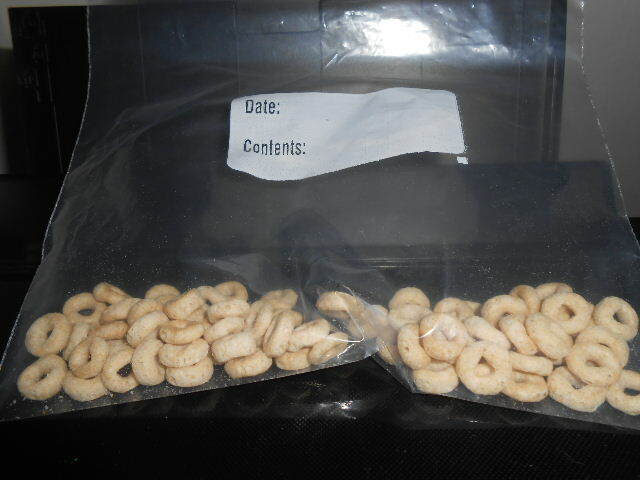 It has Cheerios in it ready for practice. I’ve already implemented my stop barking campaign. It is going pretty well so far. When my dog starts barking, I grab the plastic bag and put it in front of her. I give the hush command while pulling out a couple Cheerios. Then, I walk her away from the door. She is so intrigued by the exciting treat bag that she follows me. I tell her “Good Hush, Misha!” and hand her pieces of Cheerios. It can be challenging if whatever has got her barking stays out front for awhile. For instance, a delivery truck dropped off a package a couple houses down. It took 3 Cheerios broken into pieces to hold her attention. I am happy with the results so far. Misha already knows that there is something delightful waiting for her in the plastic bag. She stops barking when I give the command, though she goes back to barking when I walk away. It’s not perfect, but it is more effective than other methods I’ve tried. If this doesn’t work, I will try something else. I don’t give up easily. Not every dog training method works on every dog. The important thing is to keep trying. Have You Solved a Dog Barking Problem? Do you have a dog that barks a lot? Have you been able to control it? If so, what method works best for your dog? Tell us about it in the comments. I’d love to know how others have dealt with this problem. Both of my dogs are barkers if someone comes to the door or they are outside in the backyard and see someone pull up. I use a training whistle to stop the barking. I blow it when I want them to stop. It is working. Sandy, Thanks for the suggestion! I may have to give the training whistle a try. Valentino is like Misha with the front door, especially for the mailman! And yes, only a treat will distract him, but then he grabs it, and heads right back to the door with barking. He’ll bark until the mailman is out of sight. I tried the voice command “no bark” thing and it does not work. V is bullheaded! Ruth, It is great to have a dog that barks and alerts you to things. But, it can really get on your nerves when it’s at every noise. In Misha’s favor, she doesn’t bark when in the yard. The front door is another story!